According to this map, this past year saw a meteorologic drought over Lake O. But if so, why did lake stage jump three feet in under a month? Blue is wetter and red is drier. Click here to view your basin's rain chart. Keep in mind that wet season rains are routinely repressed over the lake. That's because the large water mass of the lake impedes the upward convection of air over the peninsular land mass that is the key ingredient for the summer's traditional afternoon rains. 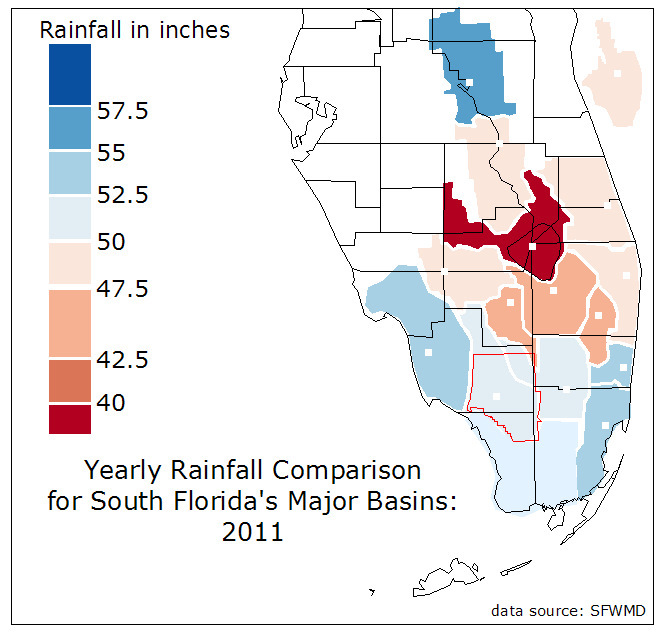 On the flip side, the Upper Kissimmee was south Florida's wettest basin for the year. And we all know where it's water eventually ends up.